Back in 2017, I painted a set of Pulp Figures PYP05 ‘The Scarlet Patrol for my friend Doug’s VBCW campaign. Since then, they have saved the day so many times that we felt the force should be increased to a full 10-man unit. Like all Pulp Figures castings, they were well-designed, well-cast, and a pleasure to paint. I’m actually a bit jealous, because they look pretty spiffy on the table. The pictures don’t do them justice, my camera is not giving good results. This is frustrating, as I have waited months for picture-taking weather. 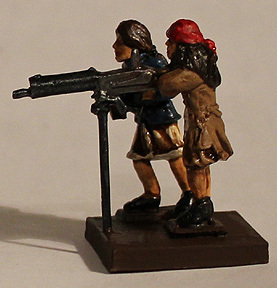 The figures I had already sent have one figure with a pistol, plus four riflemen. The guy with the pistol takes care of unit command, but we need to up-gun the force. This needed a bit of delicate surgery, so I bought a fine razor saw at Lee Valley Tools. The figure with a pistol had his right arm removed with my new saw, and replaced with the rifle arm taken from the standing figure with Winchester. It was a simple conversion, but quite effective. The next conversion was not as easy. I removed both arms from the standing figure, being careful to not damage the hat under his arm. I removed the hat from his arm, sanded the base of the hat and extended the brim a bit with putty, and fitted it to his head. It doesn’t look all that great, so I think I’d have been better just attaching the crown, and making a new brim from plastic card. The weapon arms came from a sailor figure: I cut the arms away from the body (with my new saw!) and worked the Lewis gun free. I then used files and a Dremel to remove netal from the inside section of the gun. I wanted the arms and gun as a unit to ensure the gun looked natural, and not like a random bit glued in place. When the arms and gun fit, I slid them into place and added a drop or two of glue. There was very little filling needed. Some putty was used to make gauntlet cuffs. They are based on 3/4 in (20mm) OD fender washers, covered with glue and sand. So now Doug will have a complete unit, with a little more ‘kick.’ I’ll ask him for a photo of the unit all together. 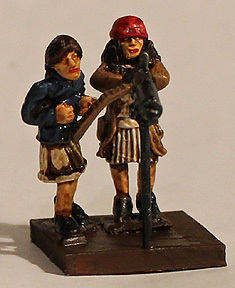 This is Pulp Figures‘ pack PYP05 ‘The Scarlet Patrol.’ Although intended for the Canadian Yukon, they can also serve (painted khaki) as dismounted Canadian troopers in the Boer War. They are well sculpted, and paint up really well. I painted them as a gift for a friend, reinforcements for his VBCW forces (As seen on his blog, ‘The View From The Hill’) A group of sharpshooting Colonials was just what they need to tip things in their favour. I also found a pair of souvenir zinc-cast Moose in the local dollar store. They are well-detailed, and a good size for 28mm. At one dollar each, they would be an economical source of mounts for a fantasy unit of some sort. I didn’t send them off with the Mounties, I kept them for my Flint & Feather natives to hunt.